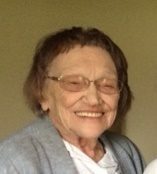 Lillian Saalfeld, 90, of Schuyler, died Sunday, April 9, 2017. at Brookstone Acres in Columbus. Lillian was born September 1, 1926, in Clarkson, Nebraska , the youngest of four daughters to Frank and Mary(Abraham) Dworak. She graduated from Clarkson High School in 1941. On April 17, 1952, she married Adolph Saalfeld. To that union, 8 children were born. They lived their life in Schuyler and Lillian was a member of St. Mary’s Catholic Church and was a lifelong blood donor. She enjoyed gardening, crocheting, gambling and spending time with family and friends. Lillian is survived by 7 children: Gwen(Bill) Wonch of Stapelton, Frank Saalfeld of Sidney, Montana, Don Saalfeld of David City, Joyce(Larry) Guenther of Columbus, Theresa (Robin) Roth of Valentine, Jeff (Yvonne) Saalfeld of Omaha and Paula(Gene) Brichacek of Schuyler, one sister, Ann Longacre of Fremont, 16 grandchildren and 9 great-grandchildren. She was preceded in death by her parents, husband Adolph, infant son John Peter, grandchildren Joshua Goebel, Brittany Brichacek, Jason Saalfeld and two sisters, Mary Ladwig and Helen Hawkins.